Shopping for bath towels? Don’t have a clue what to look for? More than anything else, a bath towel needs to be absorbent. Since it’s purpose is drying you off, if it doesn’t absorb water well, or doesn’t absorb enough, it’s not worth owning. The experiences of others. You don’t have to get opinions or read reviews, but if they’re handy, check them. It’s thickness. A thicker towel will absorb more water than a thin towel. It will also last longer. Towels lose part of themselves with every wash and machine dry. The more they have to lose, the longer they’ll last. Even if it’s a thinner towel, it shouldn’t be flimsy. You shouldn’t be able to see through it. It’s reputation ~ either the brand or the towels themselves. Experience. Your own or family’s experience with a particular brand or particular towel features. The stitching (if there is any). It shouldn’t look like it’s about to fall apart. Wear. If it hasn’t held up well to it’s life in the store, it probably needs to stay on the shelf! Some towels have a “bar” across them. I’ve found that the “bars” sometime shrink, which I find annoying. I would prefer a plain towel over a barred towel for this reason. How easy will it be to care for? Towels are usually designed to be easy care. If the care label says something other than “machine wash, tumble dry,” pass it by! Ideally, you should be able to wash and dry towels on a hot setting, if necessary. In other words, they should be tough! Colored towels might not allow for a hot wash on the label but usually light colors can be washed in hot water anyway. I have never tried washing darker colors in hot water, but it’s not strictly necessary unless you want to sanitize them or something (it’s just that, generally speaking, you wash things on the hottest setting they’ll handle, for best results). Light and dark towels don’t mix. Why? Bleeding and lint. Dark colors might bleed, at least at first. Dark colors may leave lint on any light things you wash with them. Make sure you have enough towels (and sheets) to do a reasonably sized load of laundry each time. This may mean buying only lights or only darks. The size of the towel is purely a matter of preference. Make sure both of you have a say! This impacts the towels absorbancy and quality (durability). However, it’s also a matter of preference. If you want to be able dry inside your ears or wrap your head, don’t buy towels too thick for your purposes even if they would last longer. Aside from laundering, color is simply a matter of preference. Since lighter colors handle tougher laundering, you might want to choose them. 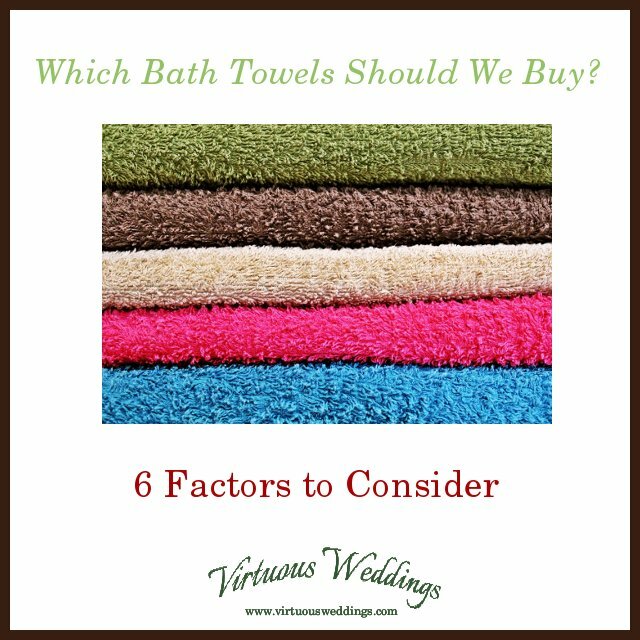 So there you have it: six factors to consider when choosing bath towels. 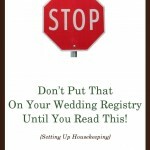 Need to find a gift registry? Try here.